Governor-elect Jared Polis with running mate Dianne Primavera at the Democratic watch party in Denver. Jason Crow thanks supporters after his acceptance speech in Colorado's 6th Congressional District. Gubernatorial hopeful Walker Stapleton concedes to Democrat Jared Polis. 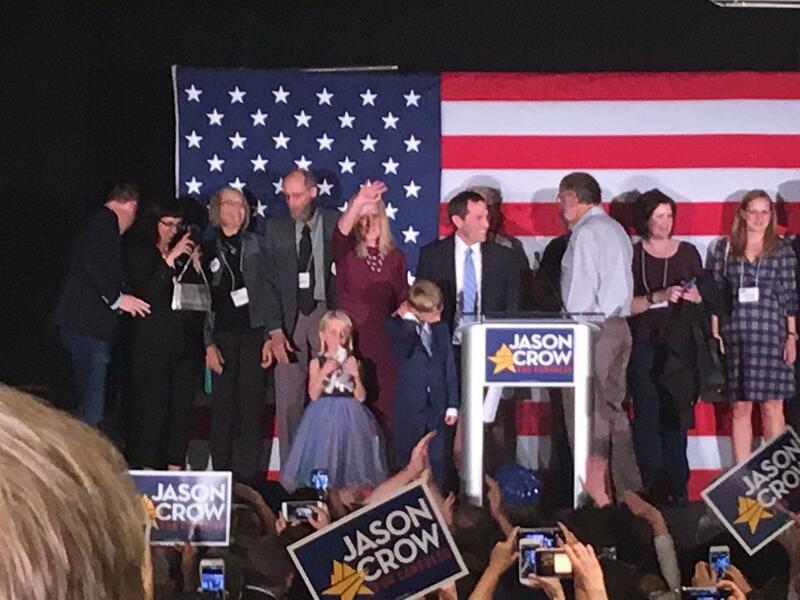 Jason Crow takes the state in Greenwood Village following his victory in the 6th Congressional District. Democrat Party Chair Morgan Carroll speaks at the Democrat watch party in Denver. 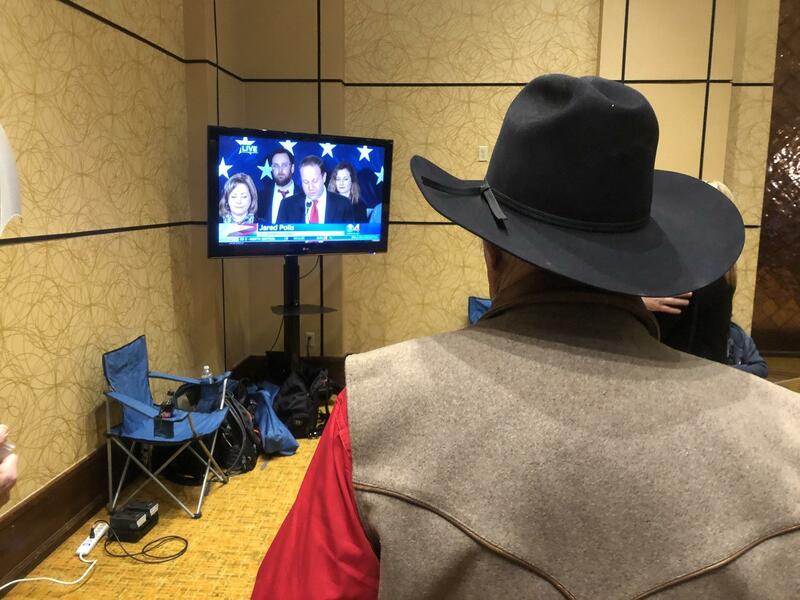 A few Republicans at Walker Stapleton's party watch Jared Polis's acceptance speech while hearing concession speeches in the same room. 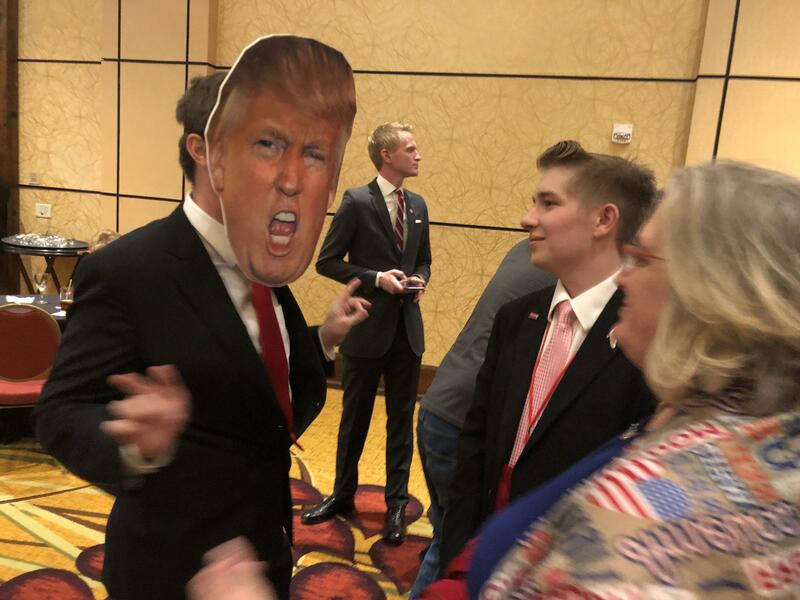 The GOP watch party continued to be lively, despite some disappointing losses. Reporters Esther Honig, Luke Runyon and Scott Franz take a look at the aftermath of Tuesday's midterm elections. 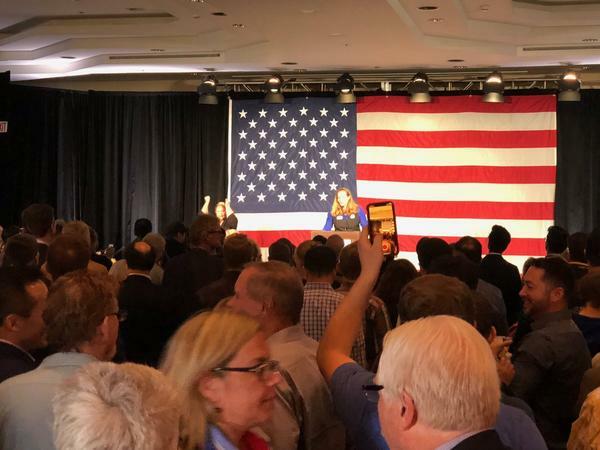 Updated 9:45 p.m. — Colorado has a new governor, but not a new party: Democrat Jared Polis has secured the top elected position in the state. 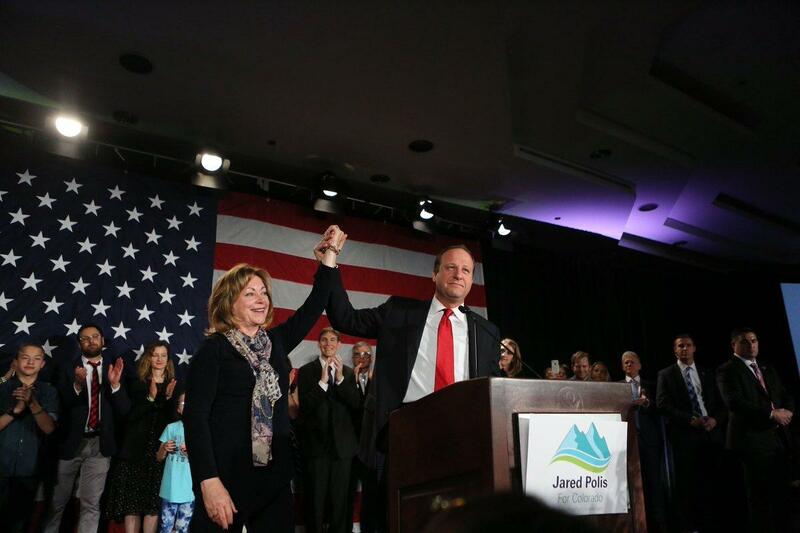 Polis, a five-term congressman, ran on a platform with promises of universal health care, strict renewable energy standards and publicly-funded childhood education. He vowed to stand up to President Donald Trump on various issues, including health care. 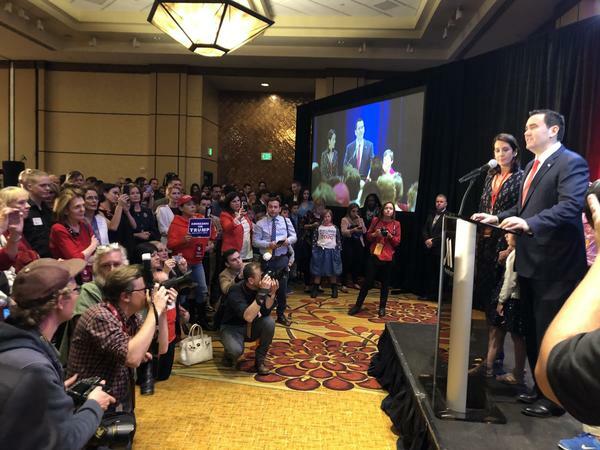 Polis is the first openly gay governor in the U.S.
"Tonight, right here in Colorado, we proved that no barrier should stand in the way of pursing our dreams," Polis said in his acceptance speech. "We proved that we're an inclusive state that values every contribution regardless of someone's sexual orientation or gender identity." Stapleton is a two-term state treasurer who campaigned on defending Colorado's constitutional restrictions on taxing and spending. He insisted Polis' ideas would bankrupt the state. 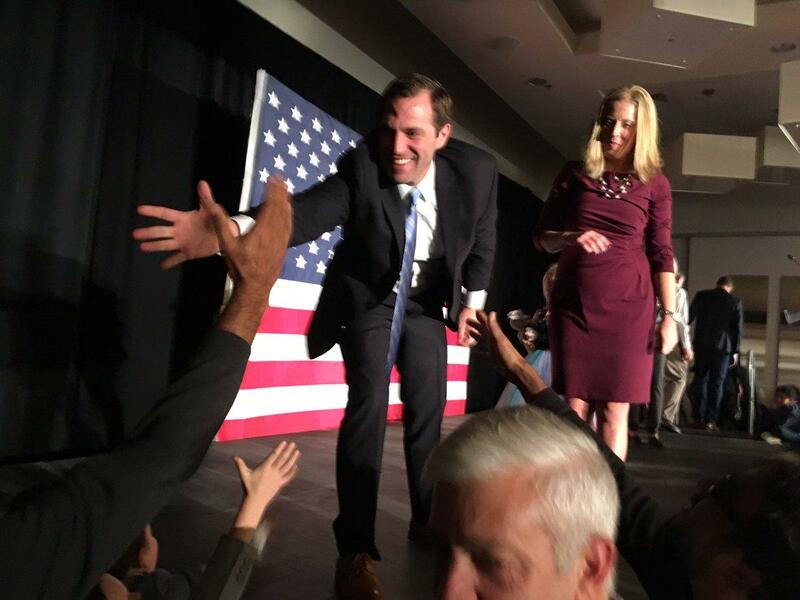 In his concession speech, Stapleton called for cooperation across party lines. "Though this has been a tough campaign, now is the time for all of us to come together as Coloradans," said Stapleton. Colorado's most competitive congressional district has voted to send a Democrat to Washington, D.C.
Jason Crow, a political newcomer, beat out five-term Republican incumbent Mike Coffman. He said he will go to the U.S. capitol to fight against President Donald Trump's agenda. "Our current leadership has gotten away with corruption and incompetence and outright bigotry for far too long," said Crow. "There have been far too many in Congress who have simply allowed it to happen. But that time is over." In his concession speech, Coffman said he had hoped to run his race about his own leadership, not about the president's. "In this congressional district, in this race, it was a referendum on the president," he said. Democrat Phil Weiser has secured the attorney general race with a narrow victory over Republican George Brauchler. Democrat Dave Young will replace former state treasurer Walker Stapleton, who ran an unsuccessful campaign for governor. The race between Young and Republican Watson Brian was close, with the race not called by the Associated Press until Wednesday. Amendment X, which would move regulations regarding hemp from the state constitution to state statute, passed. Colorado voters have come out strong against gerrymandering. Amendments Y and Z, which would make partisan gerrymandering illegal and set up an independent commission to oversee the redistricting, both passed. Amendment 73, which would increase funding for education through new taxes, has not passed. Opponents argued the measure would be bad for the economy and would not guarantee better academic performance. They also said the legislature would not have been able to adjust tax thresholds to account for inflation. An amendment that sought to raise campaign contribution limits failed. Amendment 75 would have increased the current limits for campaign contributions for all candidates anytime at least one gave more than a million dollars to their campaign. Gonzalez says the no vote keeps campaign contributions low. Coloradans voted down both statewide transportation ballot measures. Propositions 109 and 110 sought to fast-track highway and local road improvements. Jon Caldara with the campaign behind 109 says the failure of both measures means there's no end in sight for the state's transportation funding woes. "Given the Democratic takeover of state government, I imagine that they will be pouring that excess money to thinks like Medicaid expansion instead of our infrastructure," said Caldara. "And I think that's a mistake." State officials estimate the Colorado Department of Transportation still has about a $9 billion project backlog. State lawmaker have another transportation funding question on deck for the 2019 ballot. Proposition 112 failed to pass, but supporters of increased oil and gas well setbacks in Colorado say they're not giving up on the idea. "This is not over," said Anne Lee Foster with Colorado Rising, the group behind the failed proposition. She says the group will not stop and will likely pursue similar ballot measures in future elections. "We're going to continue to try to put common sense protections in place for our communities and try and keep dangerous drilling away from our homes and schools," she said. Protect Colorado, the anti-112 campaign issued a statement applauding the measure's defeat. "The oil and natural gas industry and its employees look forward to discussing concerns with reasonable people looking for reasonable solutions," the statement read.